Certainly, Claire Fraser wishes she were a sorceress. 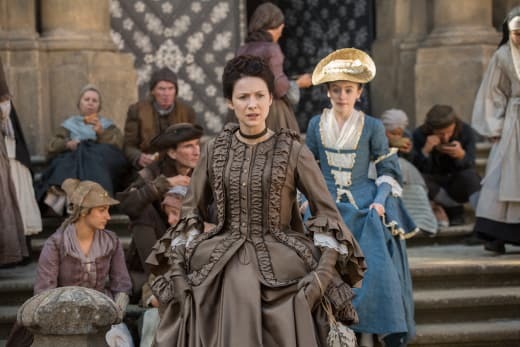 She has somehow gotten the reputation of being La Dame Blanche in the streets of Paris, but the events of Outlander Season 2 Episode 4 prove life is far more difficult for Claire than just concocting a spell to set them right. The Comte St. Germain started this hour off with a bang by poisoning Claire's drink. The man is a monster. He simply has no feelings at all, but as the hour progresses, I'm reminded women get the short end of the Parisian stick no matter the topic. But really. St. Germain being so uptight about his ship and the contents is just ridiculous. The entirety of Paris could be under lockdown due to smallpox by now. Claire should just take to walking by him saying, "You're welcome." It's not like he's going to get any angrier than he is now. He just tried to kill a woman and her baby. Well, alright. I don't know that. I kind of missed the part where they noted exactly what cascara does, but it's obviously nothing good, and when you're pregnant, your body can react to things that aren't harmful in weird ways, so no matter. It counts. It did give Claire some downtime with Jamie, though. Enough that she shared with him the news about Black Jack Randall. It was not exactly the reaction Claire expected, but it made total sense. Jamie was so damaged by what Randall did to him that the realization he died without Jamie getting to witness it was more tormenting than the idea he remained alive, because now he can correct that mistake. It's not the best scenario in the world, knowing your husband will eventually seek vengeance on the man who almost broke him, but it bought Claire some time and seemed to perk up Jamie. He smiled. He laughed. He went to a brothel to seek sexual release. Wait, what? So you had to start yourself up with a whore before you could stand to be with me? Permalink: So you had to start yourself up with a whore before you could stand to be with me? That was another shocker. My sister was walking by the door while I was watching and the married couple was arguing about 69. She remembered that very well from the book. It wasn't sexual release, but a kickstart. Still. That was a very difficult scene to soak in. Claire has been so alone. She has missed talking to her husband and knew he never fully shared his anguish with her, but she didn't want to push him, either. Meanwhile, he was hiding in plain sight, feeling fully exposed and hoping to cover himself with anything to keep from dying of the pain of overexposure. The two just needed to stop treading lightly, to bear the exposure, the raw pain of it and to find their way back to each other. Jamie: Remember I told you I was lost? Claire: You were trying to hide under a blade of grass. Jamie: Well, I think perhaps you've built me a lean-to, at least. Permalink: Well, I think perhaps you've built me a lean-to, at least. I've missed those scenes between Caitrona Balfe and Sam Hueghan. They're at their best when they're digging in deep with the characters they've come to know so well. Hopefully, this means we'll see more of them demanding what they need from each other going forward. 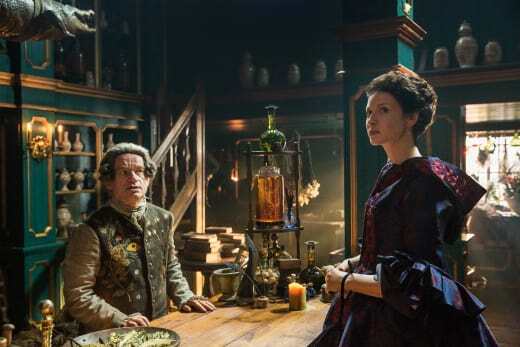 Earlier that day, Claire had made her way to the Apothecary to see Master Raymond. She somewhat took him to task about selling the cascara, but he assured her he had no idea it was intended for use on her. He didn't even know who he sold it to. He gave her a lovely, supposedly magical stone that changes color in the vicinity of poison to protect her in the future. Claire trusts him; they're becoming close friends. He lets her into his back room and even takes a peek at Frank's future using a tribal bone custom. It surprises me how quickly and easily Claire allows the notion she will see Frank again pass by. But now that she knows Randall is still alive, Claire will no doubt want to keep an eye on Jamie to ensure he doesn't end his life any earlier than the she recalls the line on Frank's family tree allowed. Even if she's with Jamie here and now, she still wishes to keep Frank's future in tact. 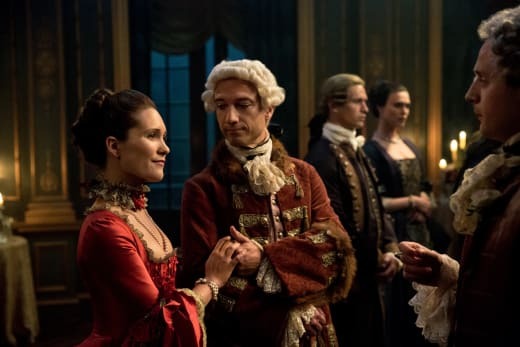 Louise summoning Claire to her side also played into Claire and Jamie's night of passion, as Prince Charles fled from his married love like a chimney sweep, rooftop to rooftop until he was pounding on their window. Like a child, he held up his hand which was grievously injured, by a bite. A monkey bite. Claire wondered if she and Jamie had become bad people to use her friend's illegitimate pregnancy to throw a wrench into the Sandringham/Prince Charles venture, but Jamie assured her good people do bad things. 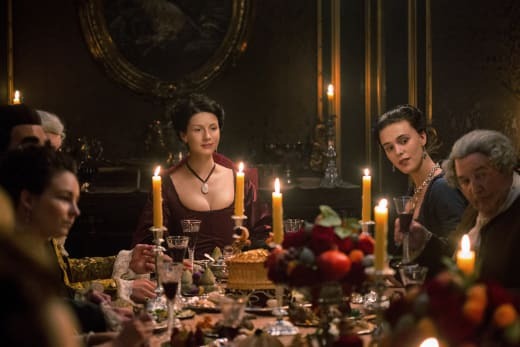 You have to wonder if Claire was considering what they were planning and the circumstances that kept her from arriving to their dinner party on time as being related in any way. What were the odds the wheel of their carriage would be damaged beyond the amount of time it would take them to walk back to Jared's? Had nobody thought of cabs yet in that time period? Whoever is spreading the rumor that Claire is La Dame Blanche kept her safe, but it was too late for Mary Hawkins, who was viciously assaulted and raped. It felt off that once Claire and Murtagh got her back to Jared's, Claire wanted to hide Mary upstairs and carry on with their plan. Jamie wanted to call the dinner off. Claire wanted to call the authorities. To Claire the dinner was too important to cancel. Jamie pointed out that Mary's father and fiance were at the party. To find out she had been raped would mean she would remain a spinster the rest of her life. I guess nobody thought Alex Randall a catch. He was concerned for the girl he was also romancing. So the party progressed. Prince Charles and Sandringham did not get on well at all. Prince Charles is such a weirdo. It seems impossible Louise would take him as a lover, and even more impossible a man like Sandringham would back him in his fight. 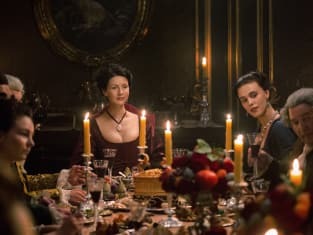 St. Germain was there and seated next to Claire, sure to point out that her necklace was to warn her of poison. Since it's her dinner party, perhaps they should all have a necklace? Sandringham kindly pointed out how lovely any child of Jamie and Claire's would be, opening the door for Prince Charles to put his foot in his mouth. He did. But right in the middle, Mary awoke, thought she was being attacked and was soon in the living area with Alex Randall upon her. Was that a nightmare or what? I'm not even sure who was fighting, but it had to be Mary's father and fiance going after Alex while Jamie and Murtagh tried to fight them off, right? Germain wanted to call the gendarme and slipped out the door. What's going to happen? Well, we knew Mary wasn't going to marry her fiance, and it's likely the dinner party plan was a bust. Nothing is working as it should be AT ALL. Claire and Jamie did kind of come off as bad people, because they put the party over their friends. At what point will they determine it's just not worth trying to change the future, but maybe they can save the people they love and keep them from going to Culloden? I just have a bad feeling about all of this. 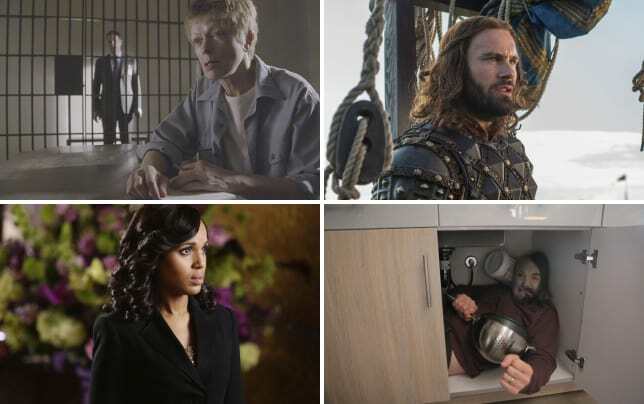 What did you guys think of "La Dame Blanche"? Are you glad Claire and Jamie found their way back to each other? Were their motivations for continuing the dinner party wrong? Drop me a comment!